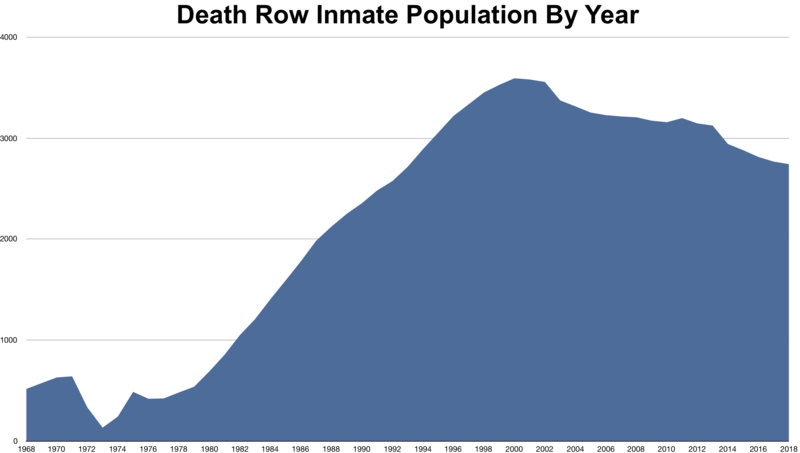 Source: Death Row Population Figures from NAACP Legal Defense and Educational Fund, Inc. "Death Row USA" (October 1, 2018). * Figures include persons whose death sentences have been overturned but who still face the possibility of being re-sentenced to death after a new trial or new sentencing hearing. The number of prisoners in the U.S. facing active death sentences is lower. ** New Mexico repealed the death penalty in March 2009, but the law was not made retroactive. 2 remain on death row. ^ The Delaware Supreme Court declared the state's death-penalty statute unconstutitional in 2016. The state's 17 former death-row prisoners have been resentenced to life without parole. *NAACP Legal Defense and Educational Fund, Inc. "Death Row USA" for Years 2017-2018 (sources use slightly different criteria for counting death-row prisoners).